Nearly all of the Michigan Road is (or was at one time) state or US highway and has been improved to modern highway standards. The only notable exception is a 20-mile section that begins about 13 miles north of Madison. It looks like any other Indiana county road. The only concession to modern roadbuilding is that it carries two lanes; the original road was one lane wide. North of Madison, the Michigan Road becomes US 421, running along the eastern edge of the 56,000-acre Jefferson Proving Ground, a former military installation , most of which today is a national wildlife refuge. Where the JPG’s border veers west, so does the Michigan Road, leaving US 421 behind. On my Saturday trip along the road, after I turned off US 421 I lifted my camera and shot some video through the windshield. No matter that this was my second trip along this part of the road and that I knew the bridge was there, seeing the bridge reveal herself as I rounded that curve made me dizzy with pleasure and delight. It went to my head, just as momentarily intoxicating as the scent of lilacs or lavender. 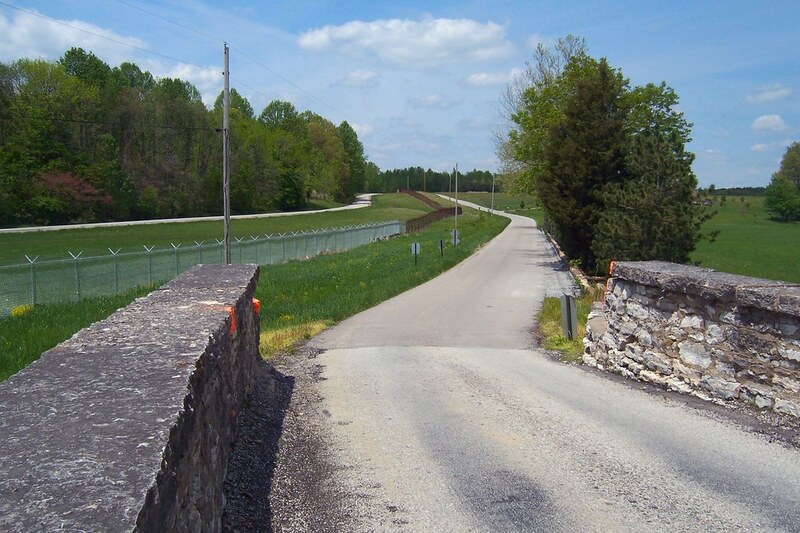 This northbound photo from the bridge shows the fence that marks the Jefferson Proving Grounds boundary and the road inside that follows the site’s perimeter. I took several photos of the bridge. Click on either of these to see them larger and to access the other photos I took on my Flickr pages. 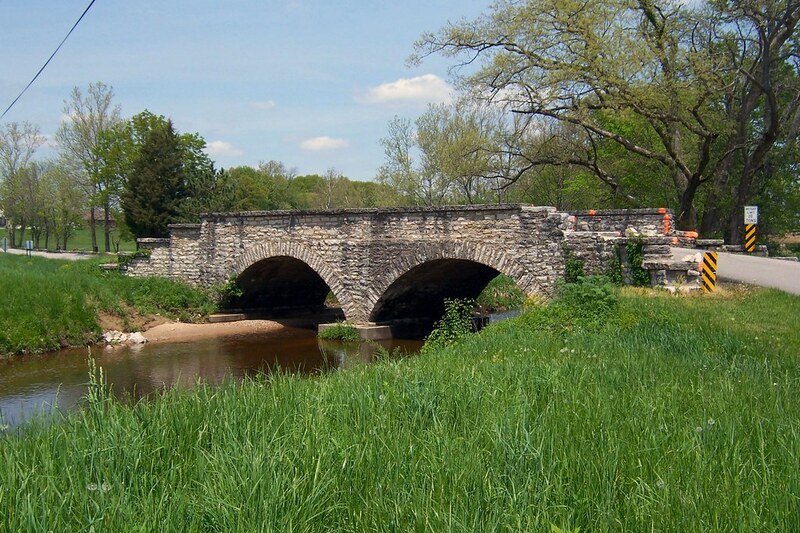 I know of two other early-1900s stone bridges left along the Michigan Road. A small one is several miles north of here along this segment. Another is on a brief one-lane segment bypassed a long time ago. I’m glad to see other people out there documenting historic roads and bridges! Thanks for viewing my blog. In the future I will be posting more about taverns, the National Road, cemeteries, old stuff, etc. I’ll put your link on my page. Your blog’s been in my reader for quite some time because of your National Road posts. The National Road is one of my favorite things. I’ve explored it exensively from Indianapolis to Vandalia, Illinois. I really want to see the Road east of Columbus, OH, where the terrain is so interesting. I’ll get out there eventually! 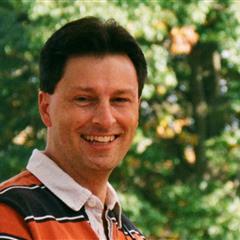 First of all, thanks for visiting my website (“The Georgia Road Geek”). I just RSS subscribed to your blogs and wanted you to know. Where exactly in Michigan is this bridge? I would love to go see it in person in the next week or so! Nicole: Unfortunately, this bridge is in southern Indiana, not far from the Ohio River! The Michigan Road stretches from the Ohio all the way to Lake Michigan in Indiana. Jeez, wow, one lane. Don’t see many of those anymore. :) Imagine that it was built in the 19th century and it’s still in daily use! LP, I made a trip down south on Saturday and stopped by this bridge. The creek was dry, so I got to go down under the bridge to see. I got some photos; they’re in my Flickr space.